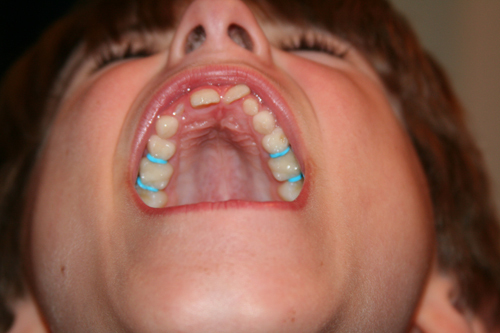 If teeth or mouths skeeve you out…you may want to skip this one. Tyler started the process of getting braces today. This will be what the orthodontist calls phase one. Tyler has a pretty decent crossbite. One side of his top jaw is outside of his bottom jaw, and the other side is on the inside. Where the crossover occurs, his top front tooth is crooked and won’t descend fully because it is pushing on his bottom tooth (instead of going in front of it). So, today he got spacers. We thought he was going in for two, but they ended up putting in four. Poor kid. He went in all *excited* that he was getting braces. The first spacer went in without any problem. The second…not so much. The girl tried and tried and then had to call over the orthodontist. He got the second one in with Tyler whimpering and saying that it hurt. That’s when he decided that we would need to put in the other two spacers. Then it got ugly. Tyler was almost in hysterics. He was crying and bleeding and trying to climb out of the chair. (Why didn’t somebody tell me that this mommy thing was so hard? I just wanted for it not to hurt him. I hate seeing my kids hurt.) We got out of there and came straight home to ibuprofen and ice cream. Now…how do I get him to go back in a week for the next step? Tell Tyler that it only hurts for a short while. Then your teeth adjust to what is happening — until the next visit and then it’s all to do again. I think you have the proper Rx for each successive visit to the orthodontist. Take the Ibuprofen before going to the orthodontist and follow-up with the Ice Cream afer the visit. It works every time. From a loving Grandpa who endured the land of orthodontica when he was a kid. I feel his pain, I have been there and done that. You did good with the ice cream and ib! I seem to remember my parents bribing me … oh wait that is how they got me to do anything I didn’t want to do! Oh, poor guy… Don’t tell him this, but I think it’s not going to get radically better. A really great orthodontist helps, though. If you don’t love yours, switch! And Grandpa’s right– medication before, ice cream after.